1. Cook the bacon over medium heat in a non-stick pan until golden brown and crisp, about 5~7 minutes total. 2. Drain on a paper towel. 3. Toast the bread in a toaster according to preference. 4. If using cheese, place on toasted bread to get it soft and melted. 5. Cut the tomatoes into this slices and set aside. 6. Lettuce can either be shredded or used as whole pieces depending on preference. 7. Combine and stir together the mayonnaise, ketchup, and relish for the In-N-Out sauce. 8. Spread the mixture on each slice of toast. 9. 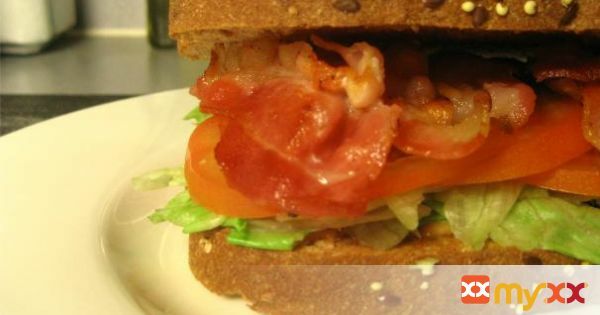 Lay the lettuce, tomato slices, and then the bacon pieces. 10. Cover with a second slice of toast and enjoy!